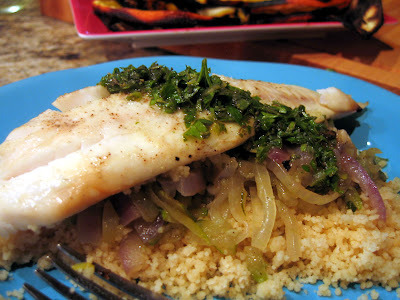 Fish is one of those foods we are trying to eat more of, but it can easily get 'boring'. To me, grilling gives a great deeper and heartier flavor to fish. The problem is many of the lighter flaky fish would just fall apart on the grill - so your limited to the tin foil pouch. I saw this idea in a photo and immediately jumped on it. Layering thin slices of oranges and lemons directly on the grates with the fish on top keep the fish just off the grills while still getting all the benefits of the grill. This works great, giving the fish a hint of citrus, a hit of grill flavor and keeps the fish together. I served these on a bed of couscous and sauteed onions and zucchini with a drizzle of Parsley Dressing. 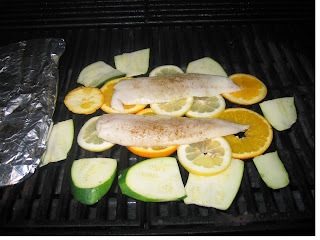 Do try this for a great new way to grill fish- it'll be one more day of eating healthy and being fat and happy! Drizzle olive oil and black pepper on the fish and let them rest. Slice the orange and the lemon in round, relatively thin slices. Rub oil on your grill; once the grill is ready, place the oranges and lemons directly on the grates. Place your fillets on top of that. In the meantime, make the parsley dressing (recipe below). Fish is done when it turns opaque.